Beer bloggers and beer blog readers will likely be aware of the 52 beers project that Stuart Howe of Sharp's brewery is running. For everyone else, here’s the summary: on a small (60 litre) scale, Stuart has embarked on a year long project to brew a different beer every week of 2010. Mandatory ingredients include experimentation, creativity and a cheeky sense of humour. Outside that anything can, and probably will, be used. He’s the Willy Wonka of beer and he’s ready to brew*. All of the beer is being bottled, some will be poured at beer festivals and industry events whilst some will probably never see the light of day. I was lucky enough to get my hands on a few bottles and this is what I thought. Oysters and stout go way back, they’ve been hanging out for time, at first as two separate entities paired together and then later fused in the brewers kettle to form Oyster Stout. Shellfish Stout takes this combination one step further by including cockles and mussels in the brew. Shell and flesh are committed to the dark depths of the boiling wort for twenty minutes, providing chloride and iodine to boost sweetness as well as body, depth and umami sensation. The beer is squid-ink-black with an aroma of dark chocolate and coffee. The palate has a subtle sweetness; big, bold roasty flavour; a pronounced graininess in the finish and more of that coffee and dark, bitter chocolate. I was expecting something massive, salty and rich; fearing something tangy with hints of fish; but what you actually get is an incredibly smooth, velvety beer that’s full of body but still feels nimble and light. Very good indeed. Some people say that less is more, others protest that you can have too much of a good thing. 50 Hop IPA tells these people to shut up, it calls them an idiot and then batters them around the head with seven more hop additions. 50 Hop IPA is a beer featuring 50 different hop varieties. 45 go into the wort whilst it boils and then 5 more are used post fermentation. It’s fermented with the Sharp's house yeast and, at an original gravity of 1065, it’s probably around 7 to 7.5 percent ABV. Half the batch were packaged as standard whilst the rest were blessed with a Bobek hop cone in the bottle. There’s burnt sugar and caramel sweetness at first but it fades away too quickly, swept aside by an assertive hop flavour that's unlike any I’ve tasted before. I could detect citrus fruit, grapefruit and grassy notes but everything feels muddled, confused, individual hop characteristics are muted by everything else that’s going on around them. Perhaps I’m being controlled by my subconscious but it tastes like each of those 50 hops gave it their best shot and then threw the towel in; you’ve got to pick your battles and when you're slugging it out against 49 others, the odds aren't great. The bitterness is big, the body quite oily, and I can’t help but detect a slight fusel note in the background. The bottle hopped version has a fresher hop aroma that doesn’t move through onto the palate, it’s my preferred of the two but still fails to deliver the bright, fruity hop explosion I’d built myself up to expect. The 52 beer experiment is still in full swing (you can follow it here). For me it captures all of the reasons why home brewing is such a great hobby; you can be as creative as you like whilst throwing caution to the wind, safe in the knowledge that the worst case scenario is a few wasted hops and some malt. The beauty of Stuart's experiment is that the best case scenario could end up in our glasses! 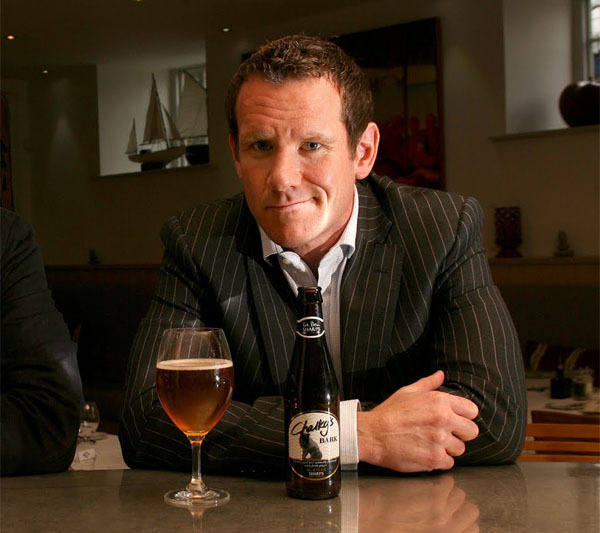 * Apparently the best of the bunch could become permanent Sharp's beers … if Stuart can get them past management. I've really enjoyed the ones of the 52 brew's ive had, ive even got a couple left, ill have to do a blog post at some point, thanks for the reminder mate! Glad you apprecaited them Chunk. I did a 3rd version of the 50 Hop which while even more hoppy was still a little "noisy". This of course is the whole idea of experimentation to see what works and what is a waste of time. Sid I am concerned that you have experienced sub optimal doom. I know what im sending out is as good as it has ever been so im keen to understand why this is not what is being experienced in the pub. "Noisy" is a good word, I like that. I've had a few of the others and ejoyed them a lot, I really hope some make it to market!